1This work concerns itself with the decisions reached by the Roman Emperors when deliberating appeals. It starts with Augustus and proceeds through to Septimus Severus Besides sources in the Digesten (D. 28,4,3 pr. ; D. 34,9,12; D. 34,9,16,2; D. 4,4,38 pr. ; D. 14,5,8; D. 26,5,58; D. 26,7,53; D. 32,97; D. 36,1,76,1; D. 36,1,83; D. 48,18,20; D. 49,14,48 pr. ; D. 10.,2,41; D. 37,1,4,24) three inscriptions (inscription of Cnidus; CIG II (1843), Nr. 2493; inscription of Athens, SEG XXIX (1979) Nr. 127; inscription of Dmeir, SEG XVII Nr. 759) will be dealt with. This work’s focus is on carving out the interaction of the formal procedure of a trial with the content of the decision as well as the rhetoric presentation of the decision respectively the decision making process (the technique and style of the ruling). The sources have been worked through in order of the deciding Emperors. 2The results of these deliberations are presented below. Within the framework of the decision making technique the Emperor’s decisions could take various legal forms. Firstly one needs to differentiate between decisions pertaining to the procedure and decisions concerning the content. Those could be issued either as final decisions, fundamental decisions, part-decisions and interlocutory decisions. Referrals to other judges were usually accompanied by an an agenda for the trial comparable to formula Those agendas determined who has to bear the burden of proof. Some rulings were amended by the Emperor by adiecta. These are about general directives which are derived from specific cases and potentially are comparable in character to an edict. As counterpart to these generalisations decisions limited to individual cases can be found. 3As formal elements of the trial could be shown to exist the central element of the hearing, the adherence to the proper way through the various “stages of appeal”, as well as diligentia during the conducting of the trial. 4In the argumentation can be found mainly considerations of „public safety and order“, the „protection of minors“, the „legal certainty“, and „res judicata“, the „protection of the bequeather’s will“, the „protection of confidence“. 5The rhetorical composition shows that the focus lies on the genus legale, that means that particularly scriptum et voluntas, leges contrariae, Syllogismus and ambiguitas were used as arguments. 6Overall it can be shown, that the Emperor – after hearing the parties as well as his advisers and taking into consideration the sometimes very complex legal opinions- often chose the one that was politically convenient for him. WANKERL, Veronika. 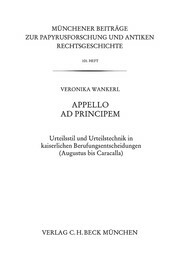 Abstract In : Appello ad principem : Urteilsstil und Urteilstechnik in kaiserlichen Berufungsentscheidungen (Augustus bis Caracalla) [en ligne]. München : C.H.Beck, 2009 (généré le 24 avril 2019). Disponible sur Internet : <http://books.openedition.org/chbeck/1190>. ISBN : 9782821846463. DOI : 10.4000/books.chbeck.1190. Wankerl, Veronika. “Abstract”. Appello ad principem : Urteilsstil und Urteilstechnik in kaiserlichen Berufungsentscheidungen (Augustus bis Caracalla). By Wankerl. München : C.H.Beck, 2009. (p. 244) Web. <http://books.openedition.org/chbeck/1190>. WANKERL, Veronika. Appello ad principem : Urteilsstil und Urteilstechnik in kaiserlichen Berufungsentscheidungen (Augustus bis Caracalla). Nouvelle édition [en ligne]. München : C.H.Beck, 2009 (généré le 24 avril 2019). Disponible sur Internet : <http://books.openedition.org/chbeck/1177>. ISBN : 9782821846463. DOI : 10.4000/books.chbeck.1177. Wankerl, Veronika. Appello ad principem : Urteilsstil und Urteilstechnik in kaiserlichen Berufungsentscheidungen (Augustus bis Caracalla). München : C.H.Beck, 2009. Web. <http://books.openedition.org/chbeck/1177>.